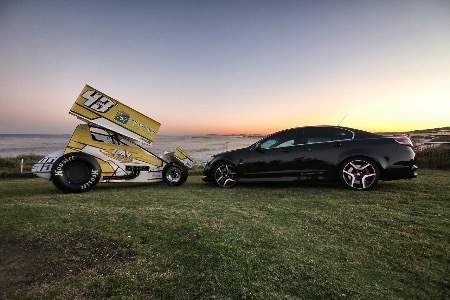 Central Coast racer Alex Orr returns this Saturday night to contest the second round of the Ultimate Sprintcar Championship NSW at Valvoline Raceway. The lively second generation racer is the 'spacer' (as his Uncle and Dad call him implying the 'space between the steering wheel and the driver's seat) for the Meander Village #43 family team and he's back with a vengeance after finishing sixteenth in the USC points in 2016/2017. Orr isn't the only revhead in the family by any means however with his Mum's pride and joy being her black Holden HSV Clubsport that you'll often see parked in the pits after the racing. Seems the idea of going fast is a common theme in the Orr fam! With a second car under the team's umbrella for Peter O'Neill this season the 'Orrsome Team' have a busy 2017/2018 in front of them. Living so close to the water Alex is a keen jet ski and water sports enthusiast but his passion is on clay come Saturday nights. This Saturday night he's one of 51 cars entered so far for the USC NSW and he's keen to improve on his opening night's result of 12th in the A-Main. Orr started eighth and moved up to fourth in the first ten laps but as he puts it "we went out too hard too early" and faded back to just outside the top ten by the fall of the chequers. The 24 year old Carpenter from South Tacoma is hoping to shave a few positions off his first round result. One man hoping to improve just one position on Opening Night's result is Daniel Sayre. Sayre piloted his gorgeous Aussie Forklift Repairs #16 to a career-best second place finish and led almost every lap before the more experienced Grant Anderson slipped by to take the victory on September 30. "I was really happy with all of it," Sayre reflected, "just not the not-winning part of course. We showed that we can run up the front and do that for almost an entire race so it's very encouraging for our sponsors and our team. It's a great way to start the season and we hope to build on that this Saturday." Returning from interstate duty for Round Two will be USC Champion Robbie Farr and rising stars Marcus Dumesny and Jesse Attard who competed in last weekend's first round of the USC SA at Murray Machining & Sheds Speedway. Farr placed second behind local hero Ryan Jones for his second straight podium finish in the ECP Hi-Tec Oils Cool chassis - he finished third at VR on Opening Night. Dumesny finished 14th whilst Attard came home 17th as the two teenagers continued to gain more and more experience both on the road and in elite competition. The pair are both third generation racers who have the unique distinction of having both their parents and their grandfathers race Sprintcars. Garry Brazier returns after a spirited run in last fortnight's action that had chins wagging as he narrowly missed out on a transfer position to the A-Main after contact with friend Guy Stanshall. Former Parramatta track champion Mitchell Dumesny makes his 2017/2018 debut driving his grandfather Sid Moore's #95 that Michael Pickens drove at the end of last season. A sea of fresh faces will fill the pits in the USC ranks as well as the established heroes all gunning for USC NSW Round Two victory. Also on the program will be the return of the Ford vs Holden Street Stocks and the first appearance of the Lightning Sprints. Pre-program racing commences from 5.15pm with Lightning Sprints. Sprintcar qualifying commences at 6.30pm. Valvoline Raceway is located at 21 Wentworth Street in Clyde.